Luxury Cotton 16mm Rope Slip Lead. 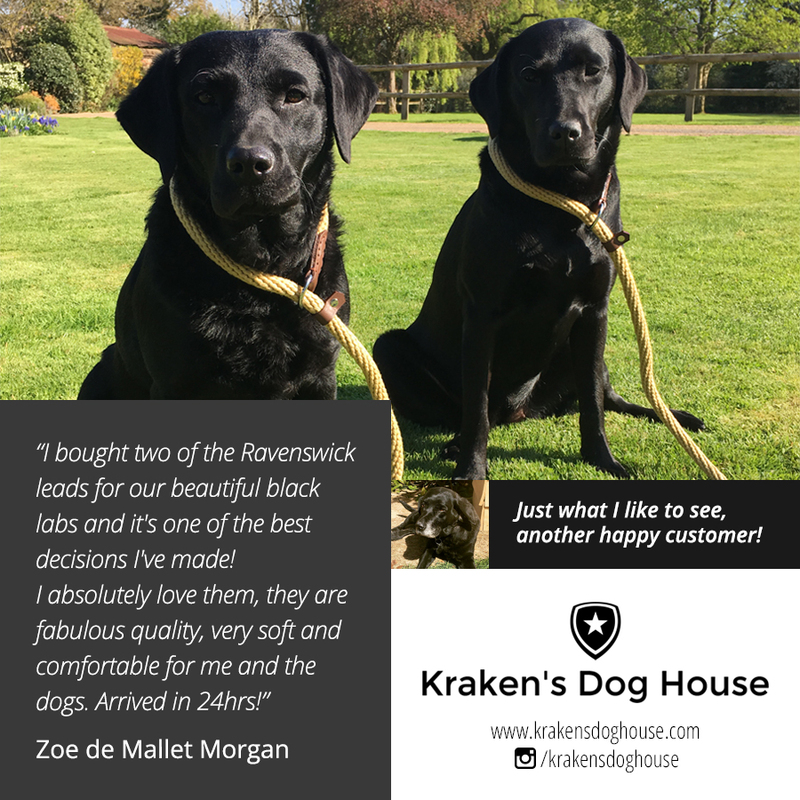 The team struggle to keep up with demand for this rope slip lead, the Ravenswick slip lead is exclusive to Kraken's Dog House. Its beautiful design means all your friends will want one. The doggy jungle drums will be making a lot of noise when you walk out with one of these on! It's the big 16mm thick of dreamy soft cotton rope with supple leather details. "The Anti-Choke" which seems like a compromise on a slip lead is set to remind me I'm on the lead rather than strangle me to death. If your human cares for you they won't set it too tight. This slip lead is designed for medium to large sized dogs I'm slightly biased but Labradors love them! 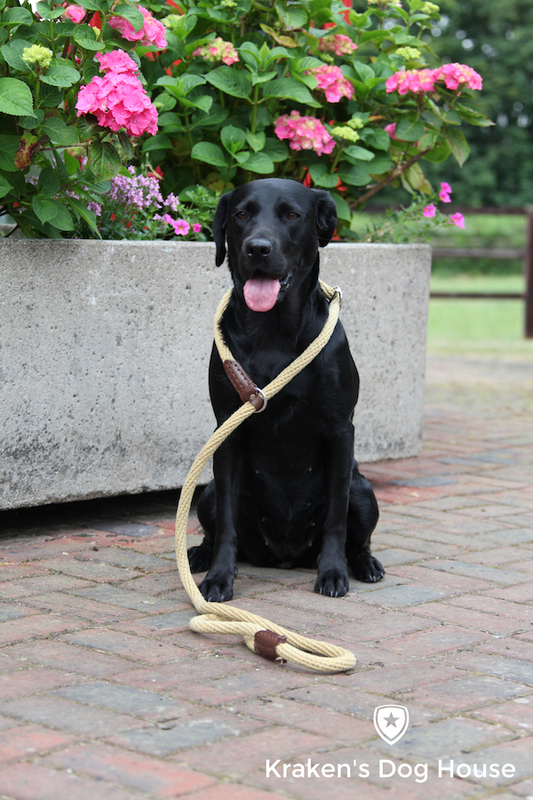 The best gundog slip lead this lead is what all other slip leads are based or copied from. True to it's original design I wanted a slip lead that is dog comfortable we often forget we have the lead on so can some times pull!. This lead comes in three colours. Black with black leather detailing, Natural with a soft rich brown leather detail and a funky red one for parties it has black leather. A truly wonderful gun dog slip lead. So I keep having arguments with my human over this one, it still can choke you it just doesn't strangle you like a normal slip lead. That round shiny metal clip thing stops the lead strangling me. But it's set at just a level that when I pull forward the lead stops me. The lead also has a leather rope stop preventing escape on a loose lead. It is also possible to use this lead as a halter lead but we do not recommend this as the 16mm Soft Cotton Rope can obscure a dogs visibility. I've taken some pain for my doggy buddies. The road test I've been on has been extensive. So why 16mm soft cotton rope slip lead? The rope slip lead sits on my shoulders and helps to remind me I have a slip lead on, just with its thickness and when I do get carried away the lead gives me a chance just to back up rather than crucify me like the thinner leads I've tried for my doggy buddies. Which colour will you choose? A black slip lead with black leather. The classic a natural rope with rich brown leather or are you the funky type who wants your slip lead to stand out then my doggy friend the 16mm red slip lead is the one for you with contrasting black leather.